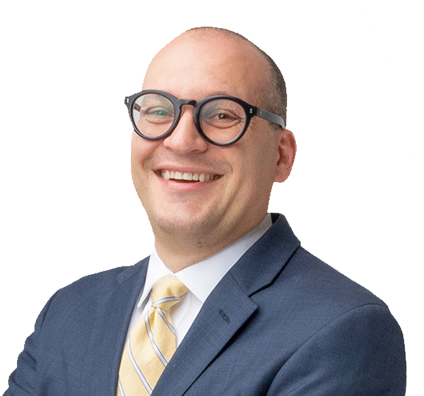 At the heart of his practice, Ben helps families navigate the complexities of their personal and financial worlds, building solutions around clients’ specific needs in estate planning. Ben designs and implements sophisticated estate plans for high-net-worth individuals. From the moment he starts talking with a client, their family becomes his family. He uses a variety of financial vehicles to create customized approaches that help his clients succeed from both a business and personal standpoint. Ben’s interest in financial solutions dates to age 24, when he and his wife found out they were expecting twins. After setting up an estate plan for his growing family, Ben discovered his professional calling: helping families protect themselves and providing them financial peace of mind. Ben left his job as a financial advisor and pursued his law degree with the sole focus of becoming an estate planning attorney. Advising prominent high-net-worth individuals and families, entrepreneurs, entertainers and celebrities on wealth preservation, intra-family transfers and business succession planning. Maximizing income tax and wealth transfer tax efficiencies by developing creative plans that protect assets for future generations, including real property, financial assets, intellectual property and other business interests. Advising clients on planning for a liquidity event, such as the sale of a company or private equity transaction. Providing guidance on charitable giving arrangements (through both direct giving and the use of trusts) so as to maximize the income and transfer tax benefits of contributions. For Ben, it begins and ends with family. If he is not working, he is with his family. Ben and his wife cherish time spent together taking in the arts, especially when it involves cheering on their four children in musical and theater performances. Another of Ben’s favorite things to do is spend time with his grandparents. Ben also enjoys entertaining. He likes to cook, throw dinner parties and find any excuse to gather with friends and family.